My personal breakthrough moment in green beauty happened several years ago when, fed up with my oily, acneic skin, I decided to give oil cleansing a try. A bottle of jojoba oil and some purged pores later, I deemed myself a convert once my skin settled into a less-congested, moisture-balanced state. 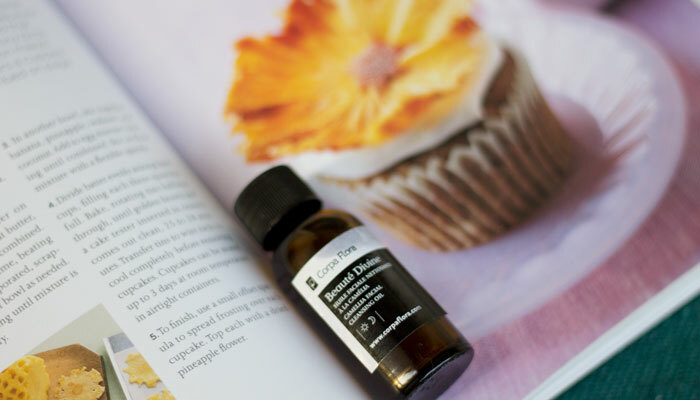 I’ve been loving on facials oils ever since, and while I keep a large bottle of jojoba stocked at all times, I enjoy exploring more complex oil cleansing treatments that combine several beneficial oils and emulsifiers. 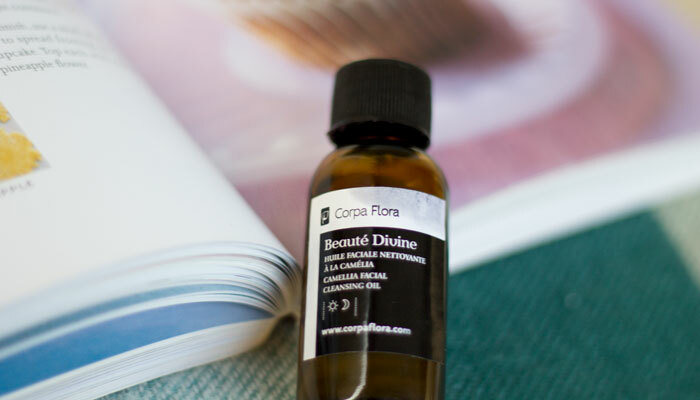 One of my recent discoveries and new favorites is Corpa Flora’s Beaute Divine Camellia Cleansing Oil. Corpa Flora combines camellia oil with sunflower seed oil, rosehip extract, cypress oil, lemon myrtle oil and rosemary leaf extract into its Beaute Divine Camellia Facial Cleansing Oil to create a cleansing oil that melts away makeup and unplugs clogs pores without irritating the eyes or skin. It has a cheery lemon-citrus smell that’s not too lemon-y thanks to being cut with rosemary. Overall, it’s a pleasant, clean scent that’s not overpowering. The facial cleansing oil glides onto the skin as any other straight carrier oil does, and though it combines several oils and extract, remains lightweight and slippery enough to massage into skin without much effort or tugging. What sets Corpa Flora’s Beaute Divine Camellia Facial Cleansing Oil apart from straight carrier oils is the fact that it contains Polyglyceryl-4 Oleate, a safe emulsifying ingredient that causes the cleansing oil to become somewhat milky when mixed with water. For those new to oil cleansing, this is a nice, comforting texture that makes you feel as if you are still using a somewhat traditional cleansing method. I, however, don’t really care for or require emulsifying agents in my cleansing oils because I’ve been oil cleansing for years and am used to it. But it is a nice touch. So when I use Corpa Flora Beaute’s Divine Camellia Facial Cleansing Oil, I skip the whole “splash your face with water to get a milky emulsion going” part and instead continue to massage my face to ensure all my makeup and sunscreen is removed and then go through about three rounds of hot compress-wiping to remove everything. I then do a second cleanse with a more traditional (but still green!) foaming cleanser or soap. Helianthus Annuus(Sunflower) Seed Oil *, Caprylic/Capric Triglyceride, Camellia Sinensis (Camellia) Seed Oil*, Polyglyceryl-4 Oleate**, Rosa Canina (Rosehip) Fruit Extract* Cupressus Sempervirens (Cypress) Oil,* Backhousia Citriodora (Lemon Myrtle) Oil, Rosmarinus Officinalis (Rosemary) Leaf Extract (and) Helianthus Annuus (Sunflower) Seed Oil*. * Organic 74.5% ** PEG-free emulsifier ECOCERT certified. Overall, I enjoyed using Corpa Flora’s Beaute Divine Camellia Facial Cleansing Oil during the past month. It came with me on several trips (love these great sample sizes! ), and I’d repurchase it again to enjoy the lovely scent and texture. Have you tried anything from Corpa Flora? What do you look for in an oil cleanser? Do you prefer straight oils for cleansing or blends like this? Tell me in the comments section!